(Vox) This is what 500 Christians think “God’s face” looks like. It’s full of bias. Cognitive bias is in all human thoughts. Even mental images of God. Psychologists at the University of North Carolina Chapel Hill recently showed 511 American Christians pairs of photos and asked: Which face looks more like God? It may seem like a strange question for scientists to ask. But for those studying the psychology of religion, it’s actually a good way to measure how believers perceive God’s mind. God has often been painted in Christian art, but the Bible provides no consistent clues about how the Almighty is supposed to look (or if God has a face at all). And as the researchers found, when the images of all the more God-like mug were averaged together, it looked like this. To me, the figure looks like a prototypical lifeguard named “Steve.” He’s kind, warm, always looking out for the little guy, and never forgets to reapply his sunscreen. This picture isn’t meant to be a definitive image of how Americans view God. “It is really about appreciating the psychological factors behind why we might see God differently than somebody else,” says Joshua Conrad Jackson, the lead author of the study. And the results hint that our views of God reflect our biases and identities. That is, we want a God that looks and thinks like us. The picture is interesting not because of what it reveals about God, but because of what it potentially reveals about ourselves. In the study, published in PLOS One, the scientists used a technique called reverse correlation. You can think of this method as a way to sketch out a stereotype. It’s used to figure out what implicit associations people have with a concept like God. Here’s how it works. The researchers start off with an image of an average American face. It’s mostly white and androgynous. Then a computer program randomly adds some distorting “noise” to the photo. This creates many versions of the face with slightly different features. Maybe one of the new faces ends up having a slightly bigger nose or a slightly more furrowed brow. Here are some examples. 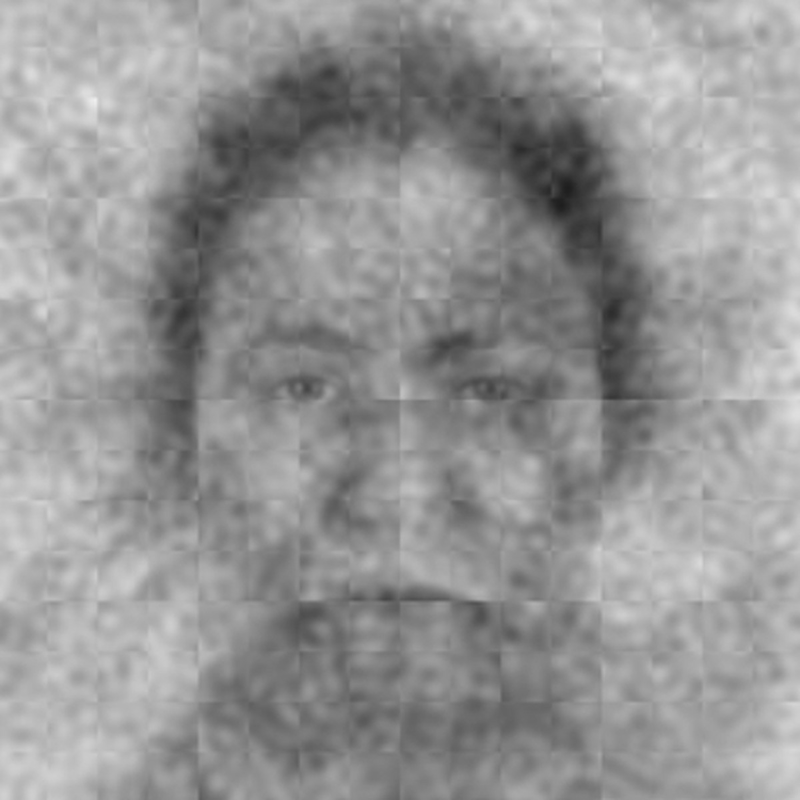 Then, participants were asked to pick between two of these newly generated images, rating which one looked more like God. It’s then a matter of collecting all the photos that people said looked like God and averaging them together. The researchers also compiled all the images that didn’t look like God, an “anti-God,” so to speak. It’s an average of all the rejected faces. It’s, well, less smiley than the one that looks like a prototypical Steve. Elsewhere, researchers have used this technique to ask, “Which face looks more like a welfare recipient?” And the answers reveal unkind, and often untrue, assumptions. The generated welfare recipients looked lazier, more hostile, and unattractive. This isn’t necessarily true, of course. But it reveals cognitive biases and how we unfairly judge others before we even meet them. Another study used this method to reveal that people think “atheist” faces are less trustworthy. With reverse correlation, the final visage does depend on the image the researchers begin with. For the God photos, Jackson and his colleagues started off with the face of an average American (which is mostly white). The final image would look much more African American if they used an African American face as a template. Or perhaps the image would look radically different if it included facial hair. Again, this isn’t about revealing a perfect portrait of how people imagine God; it’s about revealing how they think about God. So what do our stereotypes about God reveal? Above, you can see the average photo of God — and it shows that most American Christians view God as a “he” with a loving face. But what happens when you break down the sample into groups? Here, for instance, is the image of God revealed by the most liberal participants in the study on the left, and the most conservative one on the right. They look very, very similar, nearly identical. But there are some small differences when participants rated them side by side. “The conservatives’ God was perceived as more masculine, older, more powerful, and wealthier than the liberals’ God,” the study finds. And Jackson suspects that’s driven by a motivation to imagine a God that shares our political beliefs. “We think as the political differences as driven by motivation: What kind of God do they want in terms of who they want regulating society?” The results suggest that conservative Christians may want a God with more of an authoritarian bent. Similarly, the authors found some evidence of an egocentric bias; that is, we tend to think God looks more like us than other people. 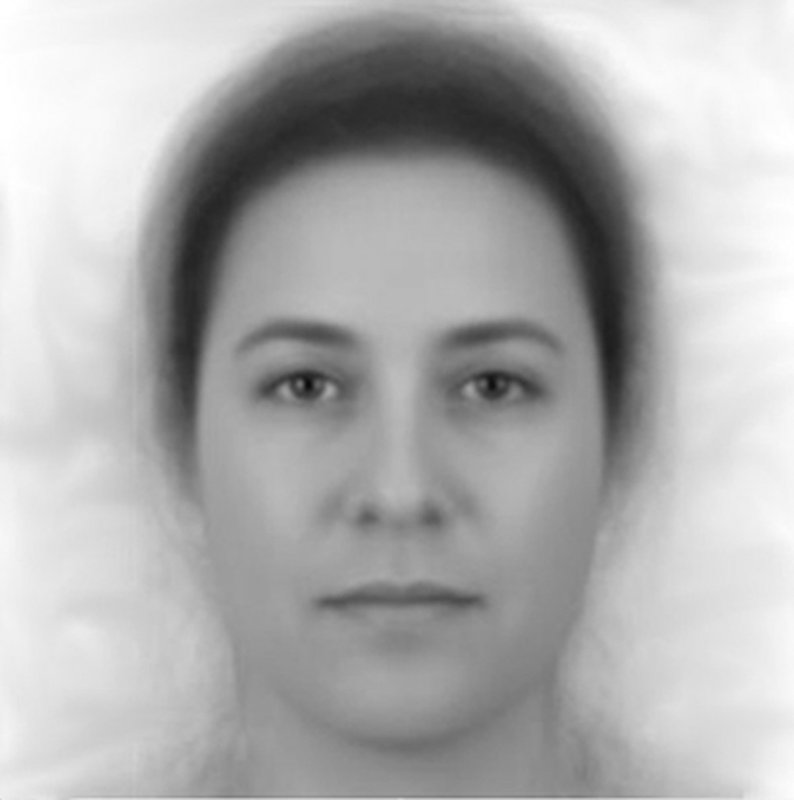 The image of God generated by the youngest participants in the study was rated to look younger than the image generated by the oldest participants. This idea isn’t new. The ancient Greek philosopher Xenophanes once wrote, “if cattle or horses or lions had hands and could draw, and could sculpt like men, then the horses would draw their gods like horses, and cattle like cattle.” God, in a psychological sense, may represent an idealized version of ourselves. Will Gervais, a University of Kentucky psychologist who studies perception of religious belief and atheism, points out some limitations of this work. For one, he says, the differences between the conservatives’ God and the liberals’ were very small, and possibly a relic of the fact that participants were asked to rate the photos side by side. If the photos were assessed independent of one another, he said, perhaps the differences would be less dramatic. That said, Jackson says this study was more about testing the methodology than assessing, with certainty, how liberals and conservatives view God. Testing a larger sample, filled with people from other religious traditions and with different starting-point faces, he says, could further elucidate why one person may have a different conception of God from another. We can imagine what God looks like because of a remarkable human ability: imagining minds that are not our own. And the face is our primary window to intuit the mind of another. When someone is crying, we know they need consolation. When they’re smiling, we can guess that they’re feeling great. One of the main features of being human is being able to intuit the minds of others and empathize with how they may feel. But our powers of mind perception don’t end with our fellow human. When many of us see a dog, we imagine they have a rich inner life, filled with desires and intentions (however more basic than ours). Kurt Gray, Jackson’s colleague and co-author on the paper, has been working on where and why people draw the line between perceiving another (or an inanimate object) as having a mind or not. What he finds is that minds exist on a continuum. For example, a robot is seen as having agency — the ability to think and exhibit self-control — but not the ability to feel emotions. Are Men On A Stable Career Path By The Age of 27 Happier In Later Life? Or men who hold many different jobs more likely to become disillusioned in later life?